In former traditional Cubs lore, this would be an utterance of impending doom. A sighting of a black cat or a hex spewing goat. But a flash rainstorm on the banks of Lake Erie on a November’s eve washed away all the curses, if indeed they did exist, from Cubs seasons past. Now, in 2017, “here we go again” means October playoff baseball for the third consecutive year on the Northside of Chicago. The times they are a changin’ for the Addison Street Miracle. Oh, it was a different ride to playoff-ville this year. Instead of the 2016 express train barreling into the station looking to win games and ask questions later, this year’s team was the local. The 2017 Cubs had a slow start and made several stops along the way before heating up down the stretch. 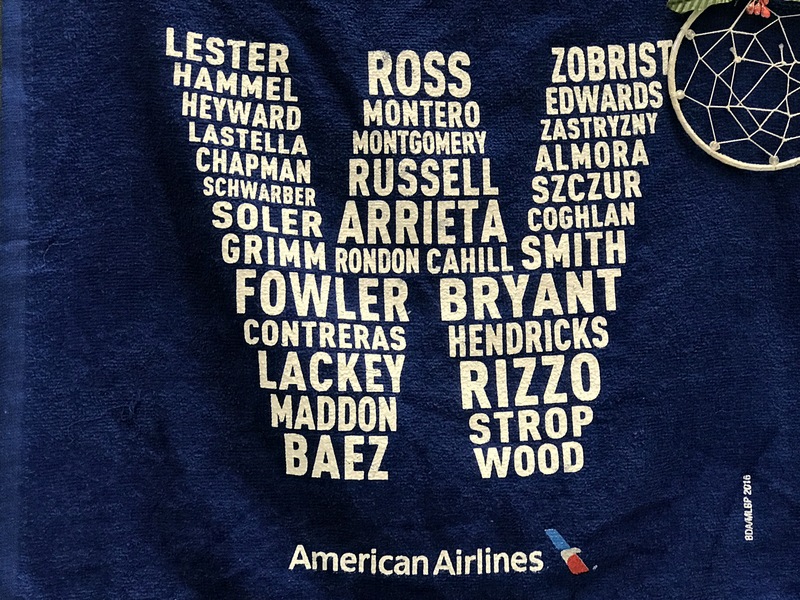 As seen in the cover photo, some old faces from the 2016 Rally Towel were gone (ten by my count), but the core remained and the result was the same. A National League Central Division title. Round one opponent are the Washington Nationals. Fondly known to their fans as the “Nats.” I find them akin to the gnats, an annoying little bug. A bothersome roadblock on the path. No home field advantage here this year. The series begins in Washington DC. A classic pitcher’s duel looms. Power versus finesse. Hendrix versus Strasburg. My notes from the game. 7:55 Game half over. 0-0. Top of 6. Strasburg with a no hitter. 8:00 Feeling a Cubs breakout here. And, it happened. Two runs. No hitter gone. Shutout gone. Cubs up. 8:40 Defensive changes in the outfield. Hendrix on the hill still. Bottom of 7. 9:00 An insurance run on a double by Rizzo in the 8th inning. The Bryzzo combo coming up big in the late innings with all three RBI. 9:30 Bottom of the 9th Up 3. Old habits die hard. Cautiously optimistic. Sort of loving a silent DC crowd. 1-2-3. Cubs Win 3-0. Home field advantage eliminated. Cruising comfortably with a two run lead and just five outs to get, Carl’s Jr. delivers a new menu item, the hanging curve burger to Bryce Harper and bang just like that the lead vanishes. Ryan Zimmerman goes yard on normally reliable Mike Montgomery and the gnats get a five spot in the 8th for a 6-3 win. The bullpen exploded. Series tied. Back to the Windy City for game three on Monday Monday, hoping never to return to that city on the Potomac. Cubs got two games at Wrigley now. Let’s win two!